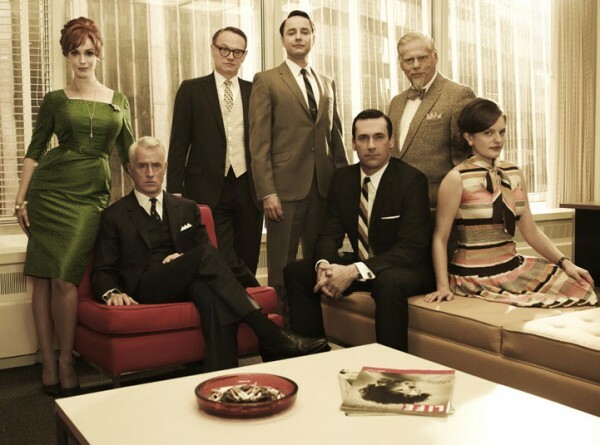 In one episode they are presenting to a client (giving them everything they specified) and the client says” well now that we see it, that’s not what we really want.” The firm also uses the right buzz words-copy, creative, budgets, media, market share, deadlines … However, in the 60s, TV is the new medium, kind of like social media is today. In the show, Sterling and Cooper are pioneering marketing research and focus groups. They mention David Ogilvy writing a book, Confessions of an Advertising Man, which ironically spurred an interest in direct marketing for Grant Johnson, founder and president of Johnson Direct. One of the ad agency’s competitors is Leo Burnett. Ogilvy was known for great copy while Burnett developed such icons as Tony the Tiger, the Marlboro Man and The Jolly Green Giant. Both of these men still influence advertising today. The show has made quite an impact among modern-day marketers; you may have seen a Mad Men-themed email from MarketingProfs in your inbox earlier this year. MarketingProfs used clever copy seemingly written by Don Draper, a major Mad Men personality and no doubt a character with a huge fan base. The message tone conveys Draper’s opinionated disposition. 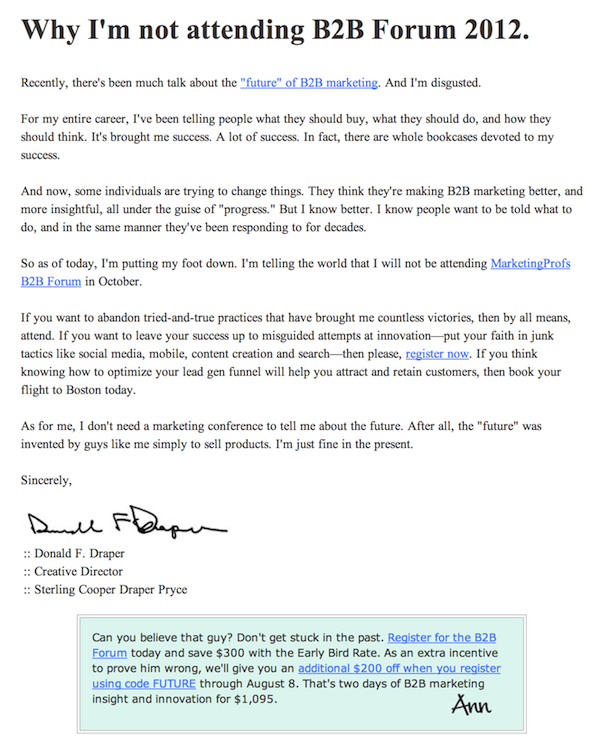 MarketingProfs nailed all the details with this email from the “From” address (Don Draper) to the signature. All that’s missing (in my opinion) is the all-important P.S. There are startling differences between working at an ad agency in the 1960s versus today’s work environment. Whether you like it or not, there are no more bar carts in everyone’s offices. Smoking is definitely out and the fashion has gone from all-business to barely-business-casual. There are some similarities to point out: marketing firms today are still striving to do great work for their clients and you’ll meet characters of all kinds everywhere you look. Whether you’re a Mad Men fan or not, I hope you’re enjoying show-stopping, truly measurable results from your agency. After all, that’s really the name of the game now-a-days, isn’t it? A Return to the Stone Age?